Thanks for your review. I can't find a copy of the journal locally and I really didn't want to order it with out flipping through it first. Now I know. I'll stick with Goodreads for lists. I have the adult version and I have the same complaint about the pages, and mine had the odd really out-of-date book blog or two as well. oh dear. so many of my favorite bloggers, including you, not there? I loved reading your review of this journal, Lenore! You've gone through it in a way that is very useful for book bloggers. I've been thinking about ordering one for myself(will probably end up doing it just because I'm curious). I'm sorry that you're disappointed with this journal! I just received my copy a few days ago, but I thought it was pretty useful as a resource. I love lists, though. I think my tween daughter will like writing in it and keeping track of her books. Hi Julie! I still think it's fun :) And yeah, teens that read a moderate amount should really enjoy it! Sorry to hear that you didn't like this journal. When my daughter saw my adult version she couldn't wait for me to purchase the teen version for her. Like you she went to the lists of books and started checking off what she had etc. She ignored Rachelle's suggestion on page 3 of how to use the boxes and made up her own method. You could do that as well. My daughter knows what it means and thats all that matters. Some goes for the Recommendations section, I probably won't use that but will re-purpose it for my wish list when that section is full. Don't worry about the resources in the back not including your favourite blogs, I had never heard of your blog nor the others you listed, yet I still managed to find my way here. I've never seen a printed list of blogs or websites that was up-to-date even the day it was printed. The internet is so fluid that the only constant is that it changes. I wonder if the blogs you mentioned as not being active are still available to browse their earlier postings? That would still make them valid resources. I'll have to check that out. I'll hope you'll give the journal a second chance and work with it and see if my suggestion of re-purposing of pages and markings is helpful. Heather - I wouldn't say I don't like it. I just don't think it's that useful to me personally. I'm glad your daughter likes it, and I'm even thinking of buying one for my god-daughter. The out of date blogs still are online, yes, so you could check out their archieves. And I do know how quickly things change around the book blogosphere. Even I am pretty overwhelmed by the amount of blogs at this point! Still, without knowing what the selection process was for blogs (an intro might have been nice - you know, saying she purposely put some out of date blogs in there or whatever), it just strikes me as an odd list. Of course that's just my opinion! Someone else may think it's perfectly fine. I haven't seen the teen version of this one yet, but I love the adult version. I love your idea of a three-ring binder type binding! It's an intresting concept for a book, but I can see your point. If she did not really bother to do suffienct research into the YA community then it's a waste. For an avid reader like me, it's not helpful. And I too would have liked more on who the author was and what made her an expert in YA and why she compiled the book. I really felt it was copied from a lot of places, nothing original. And not a lot of writing room either, which for me doesn't work. I'd give it to readers who want to start a book journal but don't read 200 books a year like I do. I definitely agree about needing an I've read but don't own (or whatever) box. Yep, I agree with Angie. At first I thought I was going to be the only one who was rather dissatisfied with this, but I'm glad to see it's not just me. It's definite great fun for that "in-between" reader, not a YA beginner but not an avid YA reader. Thank you so much for thinking of me and Bildungsroman. That's quite flattering. Lenore - Besides award winning fiction are there a lot of YA recommandations with teens of color? 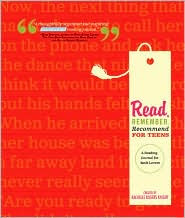 Doret - There is a list of recommendations for urban/street lit and there is a list called 30 Multicultural Books Every Teen Should Know. I have the other version, not the teen one, of this reading journal. :) Your review was fun to read, hehe! Like you, I wouldn't be making much use of the other sections because of the lack of pages and also because I don't really lend my books out. The only section for me is the awards list and probably the resources with all the blogs listed. It's a shame that outdated blogs were listed in the teen version. :/ But I'd like to get a copy of it to check out what books are listed in there!